Added to the product line on Monday, the Philips Hue White Ambiance 40W-equivalent candle bulb features the smaller E12 base for fixtures like ceiling fans or decorative table lamps. it joins the current Philips Hue White Ambiance range, which also includes the traditional A19 bulb, GU10 spot light and BR30 downlight. The Philips Hue White Ambiance Wellner and Wellness table lamps both come with an A19 800 lumens light bulb for customizable white light. All Philips Hue products can be controlled via your smartphone or tablet with the Philips Hue app, the Philips Hue wireless dimmer switch, the Philips Hue motion sensor, Apple's Home App, and Siri. 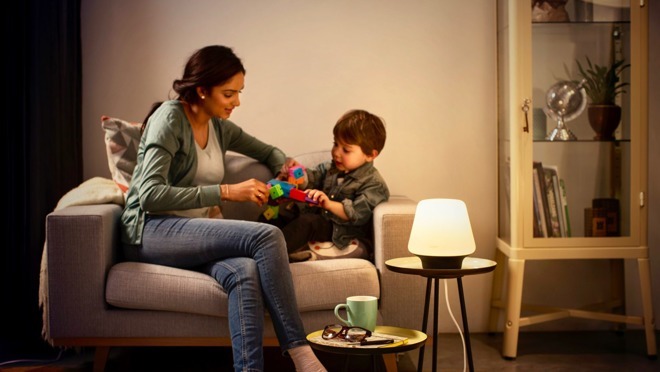 The Philips Hue Wellner and Wellness table lamps are now available for pre-order from Philips, starting at $99.99 with availability expected in June. The Philips Hue White Ambiance candle bulb is $29.99 and will be available for pre-order in June with in store and online availability in July.